I guess it’s high time I posted the painting I alluded to in this post from last week. I spent a few hours last week on this, and then added the trees and rocks and a few details yesterday, and for the moment, I think best to give this one a rest. This was my first 11 x 15″ painting. The paper seemed humongous when I first sat down to work with it. 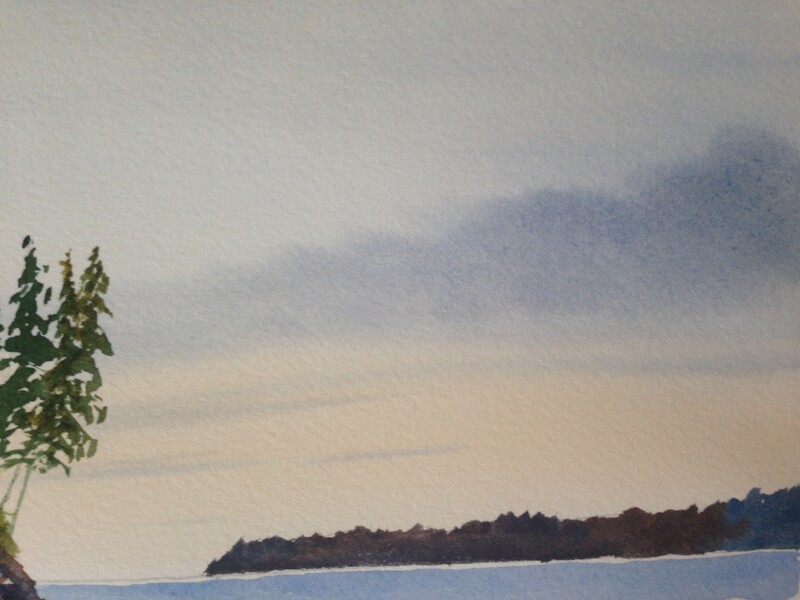 I worked very closely with a tutorial by Grant Fuller that’s available on Artist’s Network TV. All in all, I’m not sure I’m ready to work this large, but it was a good learning experience. I’m pretty happy with the sky and parts of the glowing wet sand in the foreground, and I’m slowly learning how to add in a bit of forest (rocks are a bigger challenge for me). I may go back and add more variation in the foliage. The breaking waves are a whole different story, and unquestionably the most difficult part of the painting for me. I learned from the experience that I need to do the softening off step MUCH faster. I think when I practice breaking waves next time out, I won’t try and do a scene at all. I’ll just work exclusively on the waves until I feel I have a better handle on them. As always, suggestions for improvement would be humbly received and greatly appreciated! Thank you so much for your comments and visits. I am bound to follow this watercolor train, wherever it may lead! Happy Monday, and let’s dance anyway, huh? Peace. Lovely misty effects – like it! Thanks, Nexi. I clearly have lots to learn, but gotta keep going or I’ll never get there. I’m glad you enjoyed it! ….there are ALWAYS going to be aspects of any/every painting which we rue and (in my case) pout over, which only tends to erode our confidence for the next painting. To avoid it, we do well to take leftover paper from somewhere and just do rocks (for example) — just do rocks and do rocks, until rocks are no longer an issue for us. 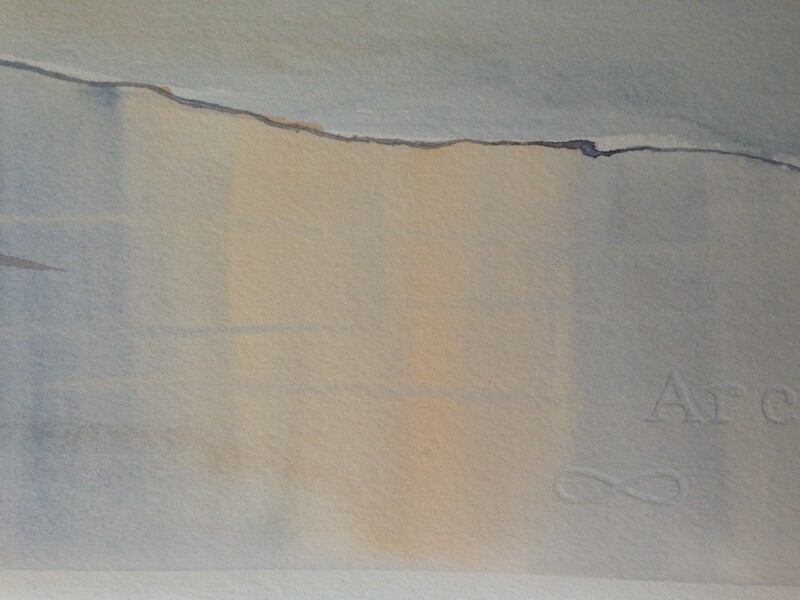 With rocks, try pressing a brush of paint onto paper, and do maybe three more of them in a grouping. Decide where the source of light is. Then go have a coffee. Come back, and wait for the shape(s) to ‘speak to you’, telling you (based on where the light is hitting them) where their ‘ledges’ are, where they need shadow, where their cracks and crannies are. They are there. And the rocks will tell you where. It is a game of doing, listening, and doing some more (without going too too far into overworked detail). Thank you, Lance; that sounds like wonderful advice (as always). I always appreciate your visits and thoughtful guidance. Oh Lance! Keep sharing your wisdom!!! And Laura – WOW! I wish I could offer great wisdom from pros like Lance, but I must simply say I am FREAKIN’ BLOWN AWAY! You are growing so quickly and expertly in this medium! I have heard that waves are one of the hardest things to accomplish! The reflection of the sun on the sand, the delicate details. I am in AWE girlfriend! Truly in AWE of this work of art!!!!!!!! Jodi, you are the sweetest. (((((Jodi))))) Thank you. I definitely learned a lot. Mostly that 11×15 is way, way too large for me, lol. That is a GREAT painting!! I can’t imagine ever being able to do that! That’s the kind of work I would expect to see in a museum. Great job! The top one is wonderful. And that reflecting sand! Wow! Good job. Thanks, Kirk! Reflecting sand is easy, it’s just a technique. Waves, not so much, lol. The top one is the whole painting but I felt like some areas deserved detailed photos to really see….probably should have left the trees out lol. I shall improve my rocks and waves! It was a good exercise. Definitely won’t be painting this large again anytime soon. Thanks for your encouragement. You are producing interesting stuff. Thanks – it helps when someone composed the whole thing and you’re just following a tutorial, though really. Composing my own stuff, not so interesting. I’m learning though. Very slow process! you did such a fantastic job with this! the sand and sky are beautiful. you have good depth in the painting. practice rocks on their own. they get easier. there are brushes known as scrubbers that have stiff bristles and can scrub away certain areas. i made my own by cutting down the bristles on a cheap acrylic 3/8″brush at an angle. i would suggest on a scrap paper make a small section of waves, or just areas of color using the blues you did. let it dry. then play with lifting color scrubbing, or wetting small area, wait, and then daub it out. really look at a wave photo and see where the lighter areas are. you go girl! OH! I think it’s lovely! Frame and hang on the wall lovely!!! Wow! I love the soft light reflected in the sand, composition and depth. Really well done! @ Lance, Ditto what Jodi said! Thank you so much! 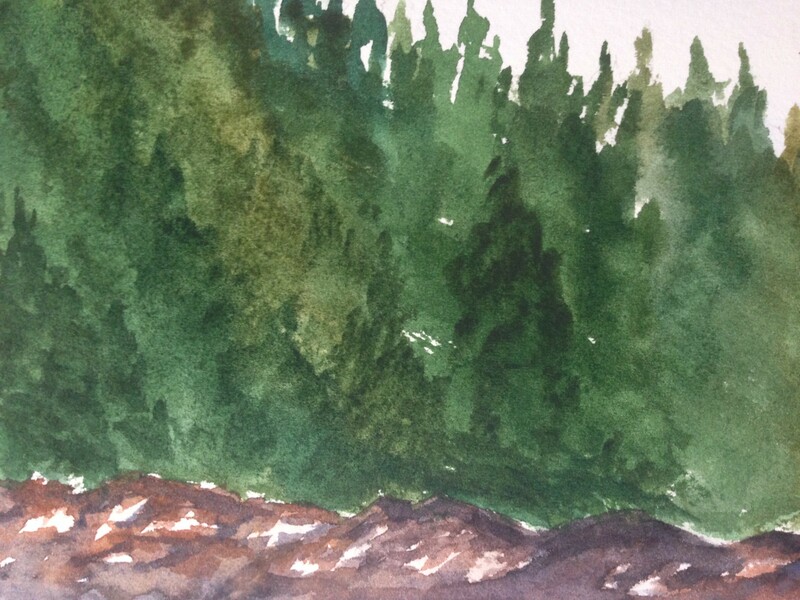 I’m learning a lot by painting every day – much more than I ever thought I would. I’m glad you enjoyed it! When I grow up I want to watercolor like you! This is so good. The waves and the reflections on the sand. Keeping your focus on watercolor is really paying off! Thank you so much, Carmel! If I can do it, so can you, lady! Following a tutorial helps a lot. Although pausing the video constantly because he goes at the speed of light was difficult! Although going so fast is why he was able to soften off his waves, so I start to see the reason for his speed. Anyway, I appreciate your comment and visit, as always, and your encouraging words. I wish I had your courage to paint strangers in the middle of a store lol! The detail of the trees and rocks show the beautiful detail and depth you were able to achieve! Waves are hard (I don’t know if I’ve ever attempted painting them), but I know you will master them! ❤ Laura! 🙂 I make a terrible teacher…ask my kids. LOL! A round of applause is due Laura. Continue on with your beautiful paintings and practice. Your dedication is inspiring. I’m glad you enjoyed them, Jean! Thanks for your comments and visits. 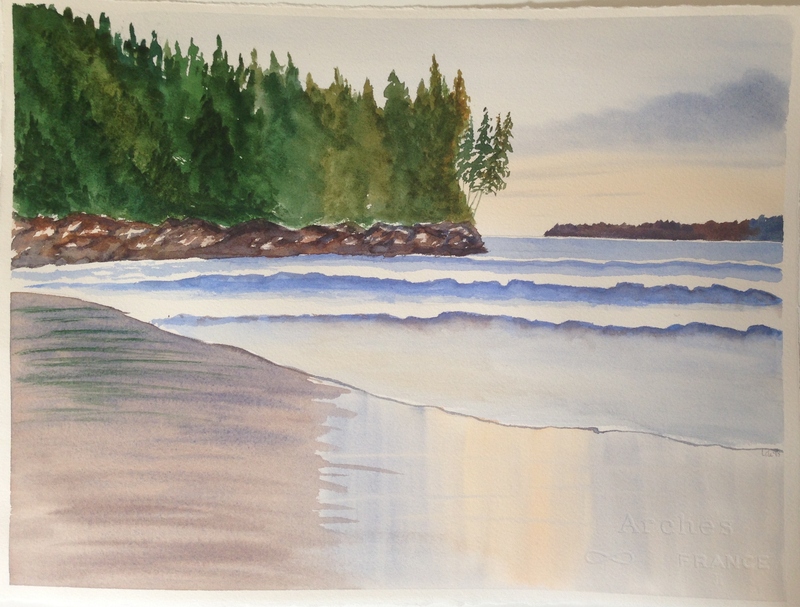 I just think the waves need softening…the rest of the painting has a misty feel. The details are wonderful, especially the sky. Thanks! I think I missed my chance to soften them though. Maybe I can rewet them and try again. Not for awhile though. Waves are definitely frustrating. I’m learning a lot from my July experiment tho. They are. I think those waves would work in a painting with harder edges though. It’s interesting to me that so many people demand a photographic look from both their own and other’s work…almost like 20th century art never happened. I think you are doing great trying to figure it all out. I can feel the wetness of water on the beach and I LOVE the trees. The waves I think could do with more free flow-maybe a wet-in-wet mixing of shades? But I really do commend you for going large-scale sure is daunting to have such a big “canvas” and hopefully enough dampness on the paint brush to last all the way! Thanks! Yeah I didn’t get back in time to soften the colors which is why I’m calling this an art fail, but at least I did learn a few things. One is that 11 x 15 is too big for me. If it’d been smaller, I’d have been able to get back and soften. I just don’t go as fast as the artist in the tutorial, who is a professional. And he didn’t let us know we had 5-10 seconds to soften. I learned that from a different artist in a whole different video. Thanks for your feedback! I think the speed and knowing what to work on while still wet would come with experience (or a lot of pre-planning) but good on you to try something different and figure out stuff for yourself! Nice job. Love the wet sand, nice effective. Sorry nice effect! Not sure where the “ive” came from. Love the water ripple effect. Nicely done. Well……my sorry version of them, anyway lol. Thanks, Nicola. I do like that glowing sandy bit, and the sky. :)) Just wish I wouldn’t have wasted so much paper. Well, it has all been said already, but this is a beautiful painting….and love hearing your experience and progression with the medium. Wow! This is just so BEAUTIFUL! The reflection on the sore is done so amazingly! This is a wonderful painting! I love it. I actually think the waves look pretty good, except I wonder whether they should be parallel to the shore, more? Lance has excellent advice for the rocks. I think the foliage, sky and sand are really wonderful. I’m glad you’re sticking with watercolor~I think you have a real flair for it. My favorite instructor in college always told us to work large, stretch ourselves. Thanks, Melissa, so much! I really appreciate it and have often wondered if I should stick with it. Lately I don’t have the energy to drag out the big palette and try and compose a painting (ha, as though I ever could), but I hope there is something within me that could ever produce something so beautiful in watercolor – just because I love it so much. None of the other paints call me in terms of creating realistic work. If you see some promise there, that really encourages me to go on. Thank you again. I definitely see promise, Laura. Keep at it, for sure, and have faith in yourself. Thanks a lot. I really appreciate it very much.